The best Cuban sandwich makers in Miami have elevated sandwich making to an art form. The larger restaurants station the sandwich maker in a prominent spot where everyone can enjoy the show. Armed with a long, thin, serrated knife, the sandwich maker expertly cuts the ham and pork, usually from a whole pork leg. Using the flat surface of the broad knife, he artfully arranges the layers of meat onto the sandwich. Glenn Lindgren: No one is certain exactly where and when the Cuban sandwich was invented. We do know that Cuban sandwiches (called "a sandwich mixto") were common on cafeteria and restaurant menus in Cuba by the 1930s, and there is some evidence of them as early as the turn of the century. Raúl Musibay: They were very popular with workers in Cuba's sugar mills. People set up restaurants inside the mills and sold the sandwiches to the workers on their lunch breaks. Jorge Castillo: In the Province of Oriente, the eastern part of Cuba, they eat a different version of the Cuban sandwich. It is exactly like the traditional Cuban sandwich, but the bread is rubbed with garlic first. Glenn Lindgren: The Cuban is a sandwich with universal appeal because it's a combination of ingredients that are almost universally loved. The Cubano is basically a grilled ham and cheese sandwich -- a type of sandwich you'll find in many cuisines from the simple grilled American cheese and white bread sandwich many Americans grew up with to the French croque-monsieur. Jorge Castillo: How does such a simple sandwich create so much passion? The Cuban sandwich is nothing more than a loaf of Cuban bread, cut in half, buttered on both sides, and stuffed with dill pickles, roast pork, ham, and Swiss cheese -- not exactly rocket science. 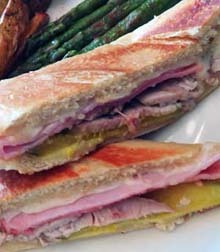 Raúl Musibay: There are a couple of variations on the Cuban sandwich worth noting: "Sandwich Cubano Especial " with thinly sliced Serrano ham that adds a salty tang. Or one of my favorites, the Cuban sandwich with olive salad. I had that one many times in Cuba. The Cuban Sandwich (Cubano) is basically a grilled ham and cheese sandwich -- Cuban style! Preheat a pancake griddle or large fry pan to medium hot. NOTE: Most people use a sweet cured ham (jamón dulce) or bolo ham for Cuban sandwiches (Cubanos). If you can find these hams in your area, great. Otherwise, look for a slightly sweet, soft textured ham with a mild taste. You don't want the flavor of the ham to overpower the rest of the ingredients! Also, never use shaved ham or pork in a Cubano sandwich! Grill the sandwiches for two to three minutes then flip them over to toast the other side. Once the cheese is melted and the bread is golden brown on both sides, the Cubano sandwiches are done. Make sure your griddle or fry pan is not TOO HOT! Otherwise, the crust will burn before the cheese melts. For an extra treat, make your Cuban sandwich in the style of several Miami restaurants ("Sandwich Cubano Especial ") with thinly sliced Serrano ham. Another variation that was very popular in several areas of Cuba is to add an olive salad or giardiniera to your Cuban sandwich. This make a salty/vinegary flavored Cubano that is a great change of pace. This is a favorite of Raúl. Tip: Let your meats and cheese come to room temperature. This way you avoid over toasting the bread and the cheese melts perfectly! This is especially helpful when you have a lot of meat in your Cubano sandwich. Most people use a sweet cured ham (jamón dulce) or bolo ham for Cuban sandwiches (Cubanos.) If you can find these hams in your area, great. Otherwise, look for a slightly sweet, soft textured ham with a mild taste. You don't want the flavor of the ham to overpower the rest of the ingredients! Also, never use shaved ham or pork in a Cubano sandwich! You may substitute French bread if you must, but NOT a baguette! Additional bread options: hoagie roll, Mexican bolillo, or Jimmy John's loaf. Use a mild Swiss cheese. We like Baby Swiss, it has only a few holes. For extra flavor, sprinkle a little mojo (or meat juices if you make the recipe below) on the meat before adding the cheese. Even using mustard is a personal choice. We find that the best Cubano sandwiches don't need it. The butter, natural meat juices and yes -- even the pickle juice -- give it all of the moistness and flavor it needs. However, at lunch counters, we've seen many people dipping their Cubano sandwich into a little mustard. So it is perfectly acceptable to serve these condiments "on the side." Anyone who makes a Cuban sandwich (Cubano) with garlic aioli (as we see so often in restaurants in the rest of the country) either has delusions of grandeur or just doesn't get the concept! 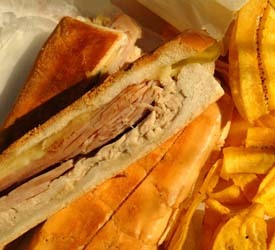 And yes, people from Tampa, we know you claim to have invented the Cubano sandwich (we're not even going to go there!) and that it isn't a Cuban sandwich without Genoa salami -- but that is an addition that is unique to Tampa. You won't find salami on a Cubano sandwich in just about any other city that we know about! So Tampa Cubans, take pride in the fact that your Cubano sandwich is truly unique. As for the argument that a "true Cubano sandwich" is never pressed, if you really like it that way in Tampa, more power to you! Glenn Lindgren: What makes a true Cuban sandwich is the exact combination of ingredients. It's a very simple recipe: pickles, pork, ham, cheese, and bread. The pork adds the Cuban touch as it is slow roasted with plenty of mojo, a delicious citrus and garlic marinade. Raúl Musibay: To make the traditional toasted and flattened Cuban sandwich, restaurants use a special press, called a plancha -- think Panini press without the ridges. What makes the Cuban sandwich great is that they are pressed between the two hot plates of the plancha. You end up with a sandwich that is thin, hot, crispy, and oozing delicious melted cheese. Glenn Lindgren: No plancha at your place? No problem! We've had great success pressing them on a griddle with a bacon press, or heavy cast iron pan. Many home cooks use a brick wrapped in aluminum foil. Raúl Musibay: Of course there is only one bread that works best, and that's Cuban bread. If you can't get your hands on any, a fresh loaf of French bread can be substituted, with less than ideal results -- but hey, if you're hungry enough... Ideally, you need a loaf that is crusty on the outside and soft in the middle. Jorge Castillo: Never use a baguette, which is too narrow and too hard to press correctly! Glenn Lindgren: The best Cuban sandwich places in the country use a variety of Cuban bread , called "pan de agua." This bread is longer and thinner than a typical bakery loaf and slightly under baked so that when it arrives from the bakery the crust is only lightly browned. This allows the sandwich to spend more time on the plancha without getting overly brown. The result is a sandwich that is golden brown and crunchy. Raúl Musibay: Desperation is the mother of invention, and when you really want a Cuban sandwich, you will use whatever bread you can find! Glenn Lindgren: When away from Miami, I have used everything from an Italian loaf to a hoagie roll. Another option that works very well is Mexican bolillo bread. It makes a smaller, medianoche sized sandwich. Finally, if you have a Jimmy John's franchise in your area, stop in and buy a loaf or two of their bread to go. The bread is very similar to a pan de agua, and compresses nicely. Jimmy John's sells day-old loaves for 50 cents and most locations will sell you a freshly baked loaf for a dollar. Ask! Jorge Castillo: The same ingredients used in the Cuban sandwich are also used on a smaller bread made from a sweeter egg dough and called a "medianoche" or "midnight" sandwich. The smaller version was designed to be a midnight snack, and that's how it got its name! Raúl Musibay: In Tampa, they add Genoa salami to their Cuban sandwiches! That is something you won't find on a Cuban sandwich anywhere else! Jorge Castillo: Only in Tampa! Glenn Lindgren: In the early days of Ybor City, where the Cuban sandwich was popularized, the only ethnic group as numerous as the Cubans were the Italians. So it's understandable that there was a little blending of the two cultures, at least when it came to Genoa Salami on a Cuban sandwich. Jorge Castillo: One thing is certain. Once you've had a Cuban sandwich, you'll crave them forever! The most delicious recipe for Cuban pork will make your Cuban sandwich sing! This new Kindle version contains all of the recipes and editorial copy from the original print edition. As a bonus, the new Kindle edition includes 24 new photos of the prepared dishes. OUR COOKBOOKS ARE NOW AVAILABLE AS KINDLE EBOOKS! This new Kindle version contains all of the recipes and editorial copy from the original print edition. As a bonus, the new Kindle edition includes 14 new photos of the prepared dishes. Use the FREE Kindle Reading App and view our cookbooks on your notepad, tablet, laptop, or computer. Three Guys From Miami Show You How to Make the Best Cuban, Spanish, and Latin American Food! Recipes and additional editorial content are from the books: "Three Guys From Miami Cook Cuban." Copyright ©2004, or "Three Guys From Miami Celebrate Cuban" Copyright ©2006, or orginal to this website. All Rights Reserved. No copying or commercial duplication of any content (including photos) without the express written permission of the authors and proper attribution.